Every room at this beautiful ocean front resort is immaculate and fresh while offering a grand sense of spacious privacy. Whether walking to an Ocean View Cabaña or a Two Bedroom Beachfront Suite, the artistically raked sand around tropical vegetation and dazzling array of local artwork will immerse visitors in the beauty and nature of this amazing place. The resort also offers easy access to a myriad of activities and adventures nearby. 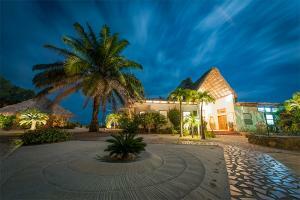 Located on the beachfront just minutes away from the Garifuna Fishing Village of Hopkins.